Murphy & Landon is a dedicated firm of trial attorneys. We have been on the front line of some of the biggest personal injury cases in Delaware, including a landmark $13 million verdict in a nursing home negligence case. We take on cases that other lawyers won't because of the level of difficulty involved or the size of the opponent. Our multimillion-dollar victories in Bailey v. Beebe, Caldwell v. White and Rowlands v. Lai stand among the largest medical malpractice verdicts in Delaware history. Our $5 million recovery in Crowhorn v. Nationwide was the first successful consumer class action ever prosecuted against an auto insurer in this state. Fundamentally, we're trial lawyers. 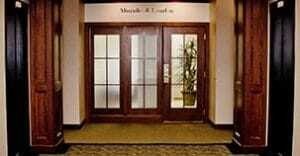 Our attorneys have vast trial experience and proven results. Yet we know trial is not necessarily the best course of action for every case. Our reputation as strong trial lawyers gives us the ability to push for favorable settlements or fight for clients in the courtroom — whichever is necessary for success. Our experience trying cases comes from our background as defense lawyers. Over the years, we have handled high-end litigation in Delaware for major law firms, insurance companies and corporations across the United States. Our past client list includes familiar names like Chrysler Corp. and Lloyds of London. We use this well-rounded experience to the benefit of personal injury victims and insurance policyholders. consistently achieve verdicts and settlements that are among the largest in Delaware, including numerous multi-million dollar recoveries in personal injury, medical malpractice and wrongful death cases. Frank Murphy is a trial attorney with more than 35 years of litigation experience. A graduate of the University of Virginia's McIntire School of Commerce and Delaware Law School, Roger Landon has been trying and winning cases in Delaware since 1986. After clerking in the Delaware Court of Chancery for the Honorable Maurice A. Hartnett, III (later a Justice for the Delaware Supreme Court), he joined Murphy & Landon in 1993. Lauren Cirrinicione concentrates her practice on representing individuals in medical negligence, personal injury and property damage claims. Kelley Huff is a trial lawyer specializing in the areas of personal injury, medical malpractice and nursing home neglect.